Named after the apocryphal exclamation of Soviet security chief Lavrentiy Beria as he rushed to Stalin's deathbed, this blackly funny, deliriously immersive satire distils the anticipation and anxiety in the Moscow air, as the Soviet despot lay dying. Late winter 1953. The lives of nearly half the planet are in Stalin s hands. A military surgeon, General Yuri Georgievich Klensky (Yuri Tsurilo), finds himself a target of the ''Doctors' Plot'': the anti-Semitic conspiracy accusing Jewish doctors in Moscow of planning to assassinate the Soviet elite. Pursued, abused, and marked for the gulags, Yuri is chased and dragged through a Stalinist Soviet nightmare. His desperate, jolting journey encapsulates the madness of the era. 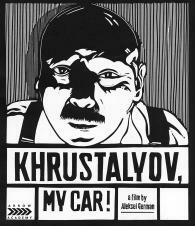 Directed by Aleksei German (Hard to Be a God), Khrustalyov, My Car! proved wildly provocative when it was screened at the 1998 Cannes film festival, despite being championed as the best film of the festival by the president of the Cannes jury that year, Martin Scorsese. A one-of-a-kind collision of nightmare and realism, German s film is presented here in a new restoration with a wealth of illuminating extras.